Let’s be honest, the majority of volunteers at Grace Klein Community are female. We do have some awesome men who help out on a regular basis, but us women outnumber them by a LOT! Over a month ago, we had a young man named Mitchell waltz into the office ready to volunteer. Mitchell was seeking a place to serve and heard about Grace Klein Community through a friend and GKC Ministry Partner, World Reach. If you are a part of our Trade Market WhatsApp group, then you may have seen a picture or two of Mitchell. He gets involved in the conversation and makes himself a part of the community. Mitchell is a jack of all trades, but not in a maintenance kind of way, more of an academic, and artsy kind of way. He is highly intelligent and incredibly creative. He can take a thought or an idea and make something tangible out of it, that is, at the same time, beautiful. He is VERY animated and quite the actor. He will suddenly fall into another character, accent and all, and transform into the rich Frenchman or the more laid back Rastafarian. All of which are very convincing. Mitchell works mostly evenings, which frees him up to share his daylight hours for community adventures. The first time he came to the office, he rode with Giorgio to rescue produce and learn how our daily Market works…from beginning to end. He isn’t above any job and it is WONDERFUL to have extra muscle to help with the heavy boxes! If you blink, you might get confused. 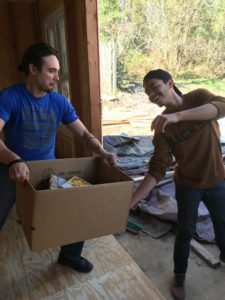 You will see Mitchell unloading the truck, but when you turn your head, he might be breaking down stubborn cardboard boxes by the recycling bin, and another turn of your head and he’s carrying 5-gallon buckets full of pig food. 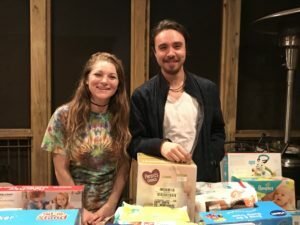 Church of the Highlands – Grandview recently selected Grace Klein Community as the receiving organization for any remaining toys for children after their Giving Hope event this year focusing on single mamas and their kids. Without hesitation, Mitchell joined in to help sort and select gift items for children recently referred to Grace Klein Community. Every year parents struggle to make ends meet and Grace Klein Community’s Gifts for the Forgotten initiative provides a little extra TLC to families who need a reminder that they are not forgotten. Mitchell served for hours with others, young and old, laughing, making jokes and listening to music while selecting the perfect gifts for each child. After a full day he finally asked: “May I have some water?” Oh dear… we were so busy we had not even thought to stop and re-hydrate, much less eat something! Please enjoy a bowl of taco soup with that water. Thank you Mitchell for bearing with us in the crazy, yet rewarding times! Mitchell is definitely a dreamer and the kind of man who will relentlessly pursue his dreams and succeed in most. He will learn from his failures, lick his wounds, and move on with renewed strength. He shares his thoughts with us, which challenge us; he shares his humor with us, which keeps us laughing; he shares his struggles with us, which keeps us hopeful about our own struggles. His diligent work ethic sets an example for current and future generations. Mitchell, thank you for your volunteer hours and all the other valuable ways you contribute to our community.